Bangladesh opener Tamim Iqbal said on Monday that they are not losing all their hope against New Zealand in the second Test. Bangladesh stare at another Test defeat as the hosts are comfortably placed to pull off an exceptional victory in the rain-shortened second Test in Wellington on Monday. Ross Taylor composed a quick fire double hundred while Trent Boult picked up a couple of scalps late in the day as New Zealand inched closer to sealing the three-match Test series against Bangladesh. Visitors were 80 for three and trails by 141 runs at stumps on day four at Basin Reserve and need to put up an exceptional batting effort to earn a draw. “Definitely it is difficult. But anything is possible in cricket because we still have seven wickets and is still Riad bhai and Liton to come,’’ Tamim told reporters after the match. “If we don’t lose any wicket or just one wicket in the opening session than there is a chance,’’ he said. “Everyone is hoping that we can bat through all the sessions. If we lost only one wicket than we would have been in a better position as far as earning a draw is concerned. Because we lost three wickets we need to cross a long road,’’ he said. “It is not easy to bat here. We should have batted better in the first innings because we got a good start. But there is a lot for the bowlers as the wicket is prepared that way. So we need to survive,’’ he said. “Difficult but not impossible,’’ he added. Tamim added that they cannot do anything apart from blaming their luck after missing to hold on to those two catches offered by Ross Taylor, who later went on to score a double hundred to put the hosts on the course of victory. Bangladesh fluffed two chances of Taylor in one eventful over bowled by Abu Jayed and that proved to be the decisive moment of the Test. Jayed forced an uppish drive off the first ball of the over only for the fielder at cover to put down a sitter. To make matters worse, just two-ball later, Shadman Islam dropped a chance in the slip cordon. “We missed the catch of someone who scored a double hundred. 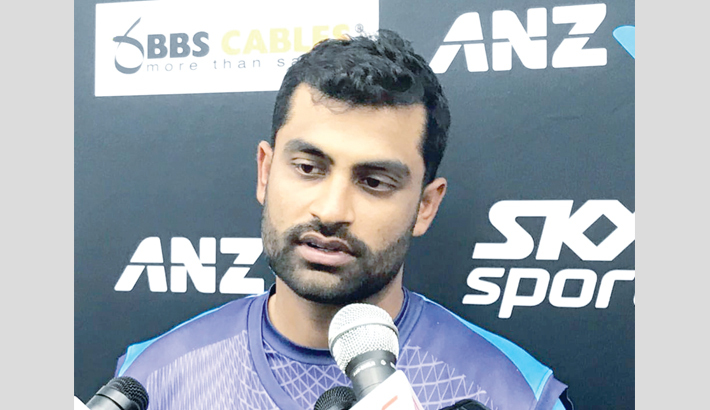 The catch is something that anyone can spill so whoever spilled it must be feeling bad but at the end of the day its part of cricket,’’ said Tamim. Tamim, who had a brilliant Test series for him in particular with three successive half-centuries before failing for the first time after being bowled out in the opening over, added that it would be extremely disappointing to lose the rain-shortened Test match at Wellington. “There is no point hiding that we will feel bad. There was no cricket for the opening two days while the result is going against us in the remaining three days. If we say that it does not hurt us it then we will be lying,’’ Tamim concluded.